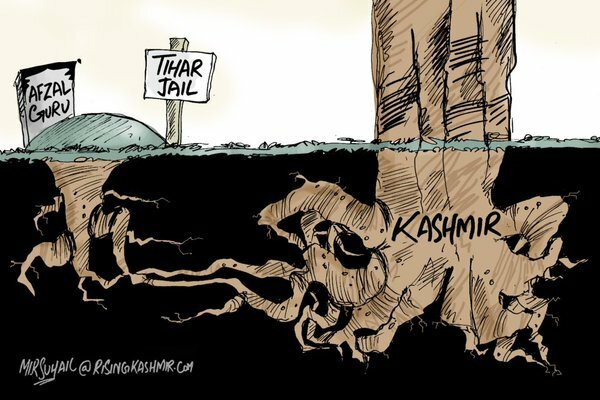 Facebook again waded into complex international politics last week when it temporarily blocked a Kashmiri cartoonist’s work commenting on the Indian government’s 2013 execution of Mohammad Afzal Guru, who was convicted as an accessory to a 2001 terrorist attack on the Parliament building in New Delhi. The border region of Kashmir has been in dispute since the partition of India and Pakistan in 1947. It is currently split between the two countries, but many Kashmiris would prefer a separate third country, and regard both India and Pakistan as occupying forces. It was in this context that five Kashmiri separatists launched a suicide attack on the Indian Parliament in December 2001, killing five police officers, one security guard, and one civilian. Mohammad Afzal Guru was not directly involved in the attack, but the Indian government alleged that he provided the attackers with logistical support and help with planning. He was convicted in 2002 and executed without advance public notice in 2013, despite questions over the fairness of his trial. He quickly became a martyr figure to many of his fellow Kashmiris, and the region has been marked by protests and shutdowns on each succeeding anniversary of his death. The Indian government also refuses to release his remains to his family, on the grounds that they could become the focus of a separatist demonstration. This incident once again highlights the near impossibility of achieving the impartial moderation that Facebook claims to apply on a global scale. The company says that content reported by users is reviewed by “teams of multilingual, impartial and highly trained people” who are familiar with the poster’s regional context, but it is difficult to believe that the overworked and underpaid contract workers around the world who assess hundreds of social media posts per shift actually take the time to weigh the cultural issues at play in a situation like Suhail’s. And with over 100 million Facebook users in India–second only to the United States–the company is all the more unlikely to consider the perspective of a minority group that is unpopular with the country’s government. Suhail did have his access restored after the 24-hour punitive block, but rightly admits that “I can’t rely on Facebook anymore” for sharing his work.